Sintering is a method used to densify powder material through atomic diffusion. Atomic diffusion occurs in materials with high rate at elevated temperatures. In most of the sintering processes, the powdered material is held in a mold or it is held in shape by high pressure compressing of the mixture of base material with a temporary binder and then heated to a temperature below the melting point. The atoms in the powder particles diffuse across the boundaries of the particles, fusing the particles together and creating one solid piece. Because the sintering temperature does not have to reach the melting point of the material, sintering is often chosen as the shaping and manufacturing process for materials with extremely high melting points such as Alumina, Boron Carbide, Boron Nitride, Tungsten and Molybdenum. Sintering is traditionally used to sinter ceramic objects; but finds applications in powder metallurgy also. A relatively newer but vastly used science of sintering metal powders to form various parts is known as Powder-Metallurgy. Microwave Sintering furnaces (lab or production scale) operate with Microwave radiation as a source of heating and offer distinct advantages to conventional furnaces. 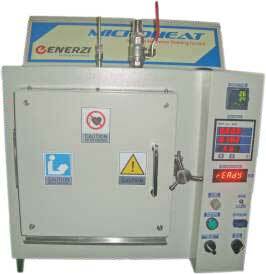 We offer a variety of Microwave furnaces for laboratory applications and production plants. We also provide solutions with hybrid furnaces where electrical heaters are combined with microwave energy for specific materials which do not absorb microwaves at lower temperatures. The furnaces we offer have controlled atmosphere with or without vacuum. 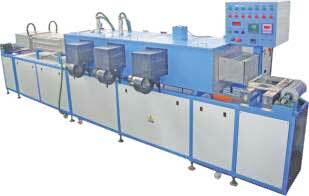 They are designed to process material in batch or continuous mode. Packed with advanced State-of-the-Art features to enable conducting various sintering experiments to establish the preliminary results. It ideally suits small quantity lab scale experiments using Microwave Technology. This is a full-fledged advanced continuous Microwave Sintering Furnace with State-of-the-Art Control system and Patented Conveying system. As it clearly indicates this is a product meant for the industries as an alternative furnace for production/manufacturing of Ceramic and powder metal parts. We recommend this product for users who have validated their process with Microwave Technology either themselves or by an R&D outfit or from our Application Development Center. This product also demands a trained team to effectively utilize the advantages of Microwave Sintering and hence Enerzi works in close synchronization with your production team to make sure that you get the best results from our system. 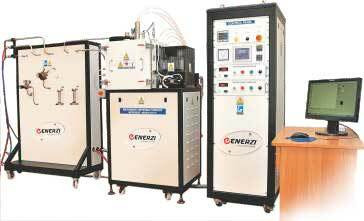 This is a revolutionary product which Enerzi offers, packed with advanced State-of-the-art features to enable conducting various sintering experiments to establish the preliminary results. It ideally suits prototype development. This is an advanced Microwave Sintering Furnace with State-of-the-Art Control system and high microwave power to sinter larger samples at a pilot scale. We recommend this system for users who have graduated from their basics in Microwave Sintering and would wish to move on to the level of Industrial Microwave Sintering Applications. 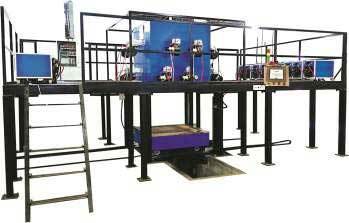 This system enables the user to sinter a broad range of materials in varied atmospheric conditions and it ideally suits industries looking at replacing their current heating systems with microwave sintering furnaces and hence it serves as a perfect bridge between lab experiments and industrial production. This is an advanced Hybrid Microwave Sintering Furnace with State-of-the-Art Control system and high microwave power to sinter larger samples in continuous mode. We recommend this system for industries. This system enables the user to sinter a broad range of materials in varied atmospheric conditions and it ideally suits industries looking at replacing their current heating systems with microwave sintering furnaces.